" Improve ghost note immunity and enhance tracking "
GKFX-1 contain specially designed filters to improve PCM/COSM tracking and ghost note immunity as well as lowering noise when palm muting. Most noted effect on GR-55, GP-10 and VG-99 when using Piezo 13-pin guitars. 13-pin GK Guitar input and 13-pin GK Guitar synth output. 13-pin patch cable included (1 meter). 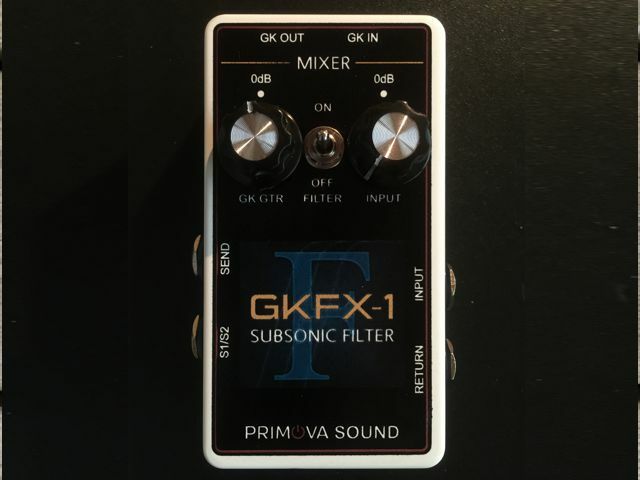 GKFX-1 is self-powered by synth unit. The filters are analog and introduces no additional latency. This unit does the same job as other Piezeo filters on the market. Every unit is carefully hand-built, tested and measured. The input jack allows you to connect a regular guitar to your synth for COSM processing. Individual volume control for the guitar jack and the regular pickups. 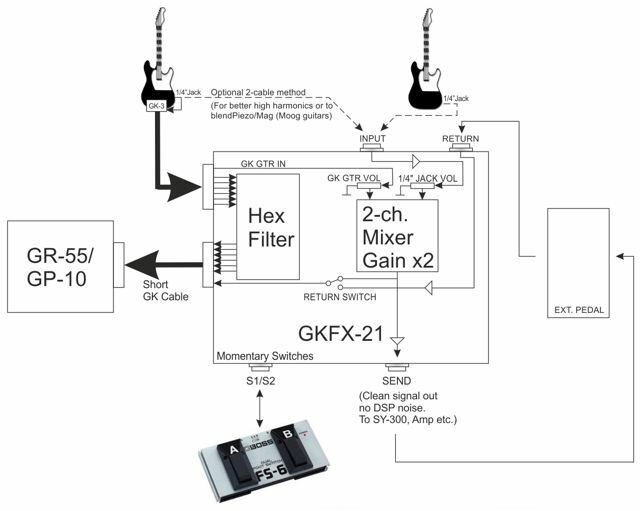 The SEND jack allows you to extract the mix of the two signals to some other device, or connect it to a guitar pedal and feed it back to the RETURN jack to create a pre-synth FX-loop. S1/S2 can be controlled by external foot switches. SEND Buffered mixer output. Blend of GTR IN Jack and GK guitar signal (GK Pin 7). Levels according to the GK GTR and JACK knobs. S1/S2 Stereo jack for BOSS FS-6 or FS-7 foot control to trigger the GK S1 and S2 functions. - The unit is powered by the synth (24mA).